We all know how to fold some kusudamas, some of us know how to make nice pics of them, some of us can even invent new models, some make extentions to existing instructions. Some of us have luxurious paper, some can make an amaizing kusudama out of nothing. Some people can inlude everything mentioned above! Please, let me introduce you Ekaterina Lukasheva, whoes models I had already have a honour to fold! (Arnica, Grandiflora, Passiflora). Now you also have a chance to be Welcomed at her personal kusudama website - kusudama.me! 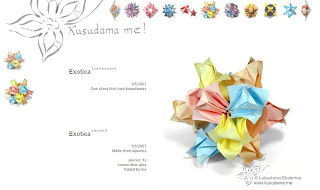 Please, come in, take a place and enjoy the process of kusudama-making!